Appetite motivates animals to eat. Level of appetite influences pasture intake rate and grazing dynamics. Ruminal fill is inversely related to appetite. As ruminal fill increases during the progression of a meal, pasture intake rate decrease, not only due to increased searching time, but also through decreased bite mass, while maintaining a constant bite rate. Despite these facts, little is known regarding how cattle adjust bite dimensions and pasture intake rate according to different hunger levels, or if variations in ruminal fill reflect changes in appetite regulating hormones. This study presents new insights in relation to the effect of ruminal fill on short-term bite mechanisms, pasture intake rate, and appetite regulating hormones levels of cattle grazing micro-pastures. The lower the ruminal fill the greater the appetite the cows feel. 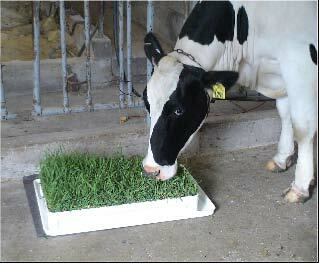 Cattle with more appetite consume more pasture per unit of time. Cattle with more appetite take heavier bites at the same rate. Cattle with more appetite take shallower bites with bigger area. Differences in levels of circulating ghrelin, insulin and glucose demonstrate the effect of ruminal fill on appetite regulating hormones; in other words, “hunger”. This study showed that cattle may adjust bite mass and dimensions as a mechanism to increase instantaneous consumption of energy in response to decreasing levels of “physical stimulation” coming from the rumen. In the progression of a meal, these hunger signals seem to be mediated by ghrelin and potentially by insulin-glucose metabolism.